A street vendor selling cooked water caltrop (菱角), a nutty starchy fruit that looks like goat horns. 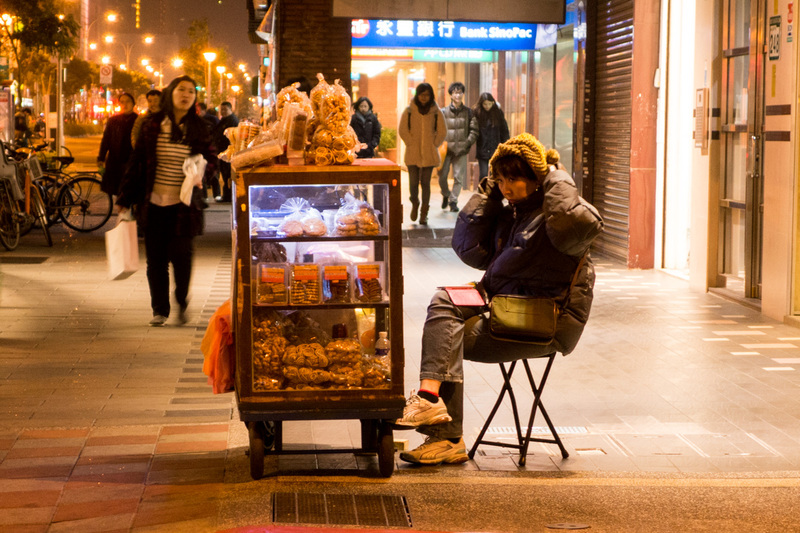 A random snap of a street vendor (I didn't try their wares). 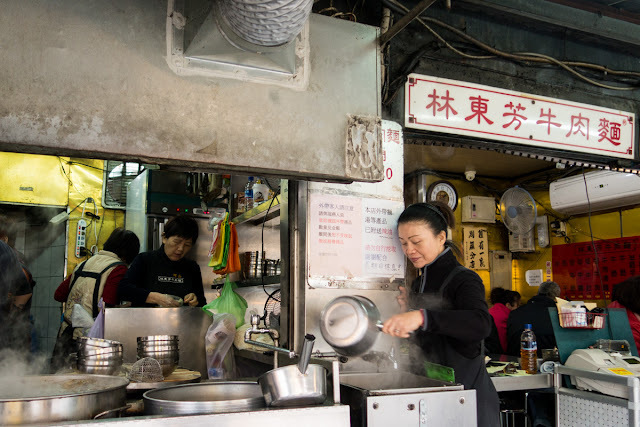 I have to admit I didn't really do a lot of research on the best places to eat in Taipei, but somehow, we stumbled upon many excellent places just sauntering around! And looking them up on the internet later, I find that many of these accidental finds are reputable, popular places with great reviews. How's that for awesome luck? 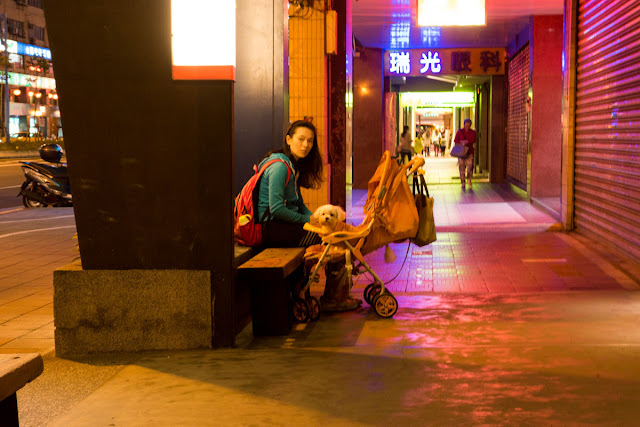 A picture of a dog in a pram, just because. Some of the best snacks I've had are often casual street eats from unassuming stalls. Chen's wine cakes (陳記京滬酒釀餅) fall into this category. 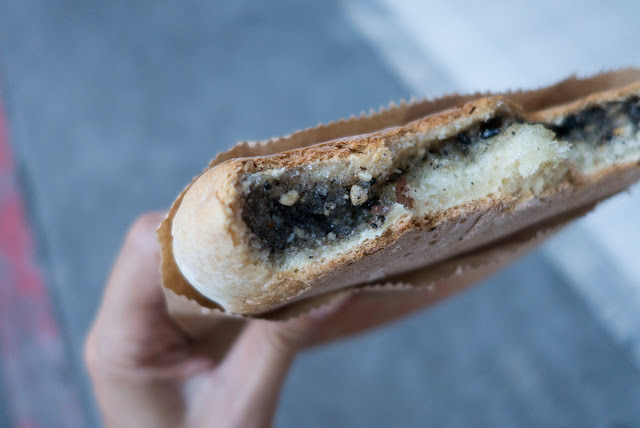 You can get these pancake-like treats in original, black sesame and peanut, red bean and green bean flavours. I think there is a savoury veggie and beancurd option as well. Chen's wine cakes (陳記京滬酒釀餅), 30 NTD each. Despite the moniker, you don't really taste any alcohol in these filled pastries. We had the black sesame one and I loved loved loved it. Crispy, toasty, warm, fluffy, it was everything, Just thinking about how delicious it was makes me yearn for it again! Black sesame wine cake with peanuts. I always knew going to Taiwan I would be sampling their beef noodles. 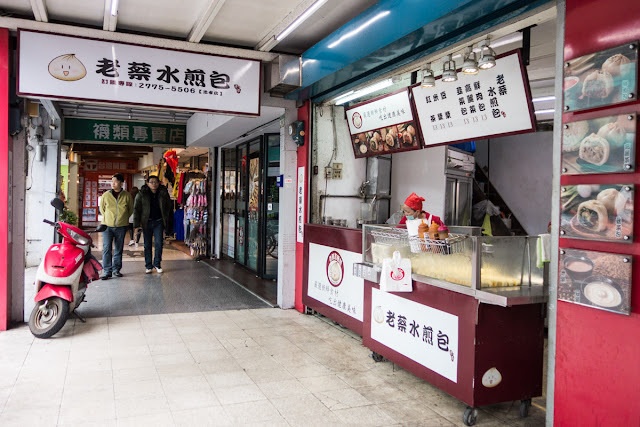 I feel fortunate that I gave Piaoxiang beef noodle restaurant (飄香牛肉麵館) a go - we went there because it was in the vicinity of Ningxia night market (寧夏夜市), and the crowds were crazy at the market, so we escaped here instead, where at least we could get a seat and there was some breathing space! It turned out to be an excellent decision. 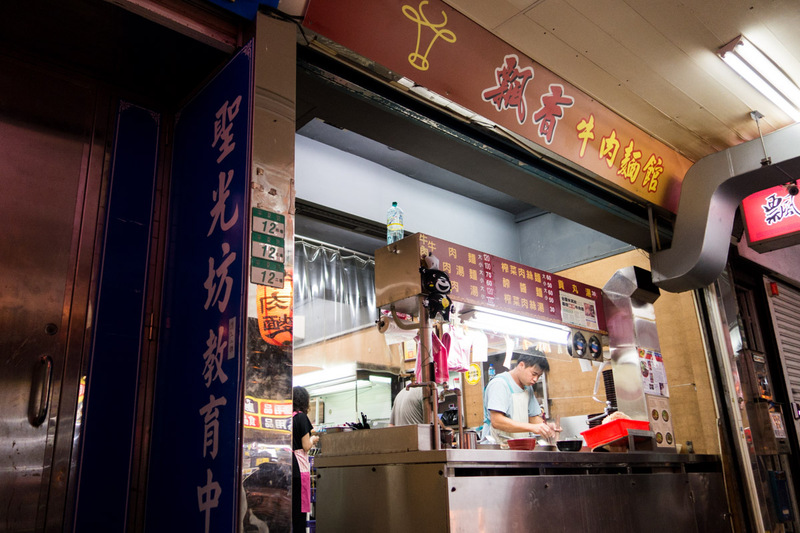 Piaoxiang beef noodle restaurant (飄香牛肉麵館). 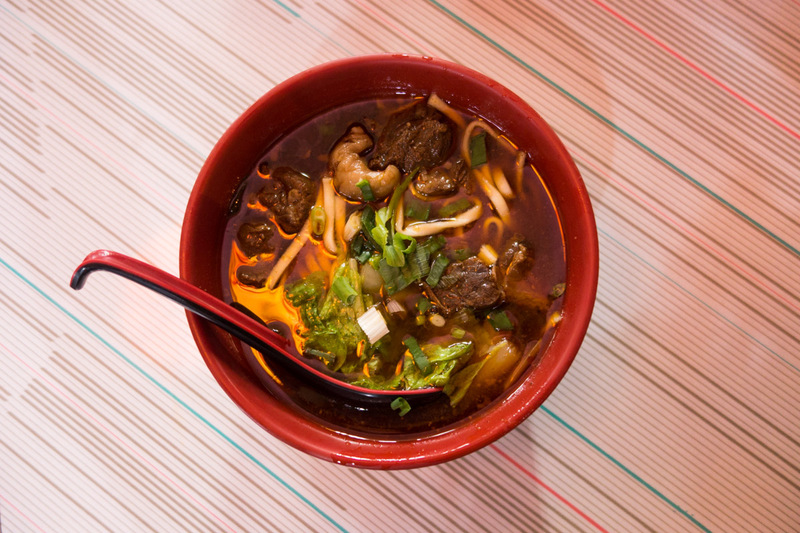 Piaoxiang literally means "wafting aroma", and the beef noodle soup here is indeed fragrant and slurptastic. There is a hint of spiciness in the broth too, making it extra-appetizing! 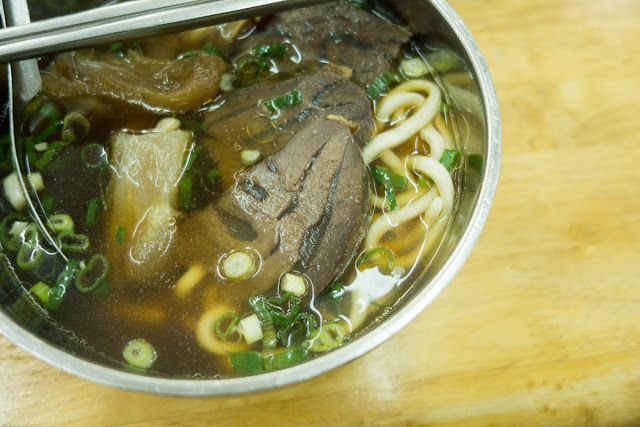 Piaoxiang's beef noodle soup, 100 - 120 NTD. Another beef noodle restaurant we tried in Taipei is the Lin Dong Fang restaurant (林東芳牛肉麵). This place is considerably more well-known (and also more expensive, but still affordable), and it was one of the few places that lazy me had actually jotted down as a place to visit. Lin Dong Fang beef noodle restaurant (林東芳牛肉麵). Here, the broth skews towards the clearer side of the spectrum, but the modest appearance belies the strength of the flavour that lurks within, with a hint of traditional Chinese herbs providing an additional dimension. This is quite a different style of beef noodles to the other one, so it's hard to say which is better. Try both! Lin Dong Fang beef noodles soup, 140 NTD - 170 NTD. 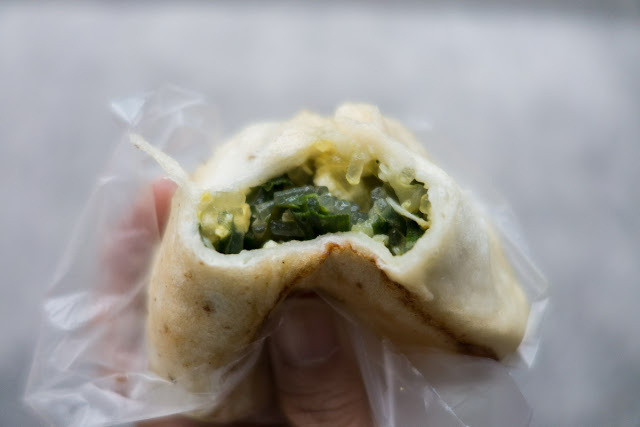 For buns on the go, we found Lao Cai's Shuijianbao (老蔡水煎包) to be pretty reliable quality. The buns are steamed, then pan-fried to achieve a nice crispy crust on the bottom, while other parts remain soft and tender. The shop is open morning to night, but we tend to go for breakfast. A couple of buns and a drink here, and you're ready to take on the day! 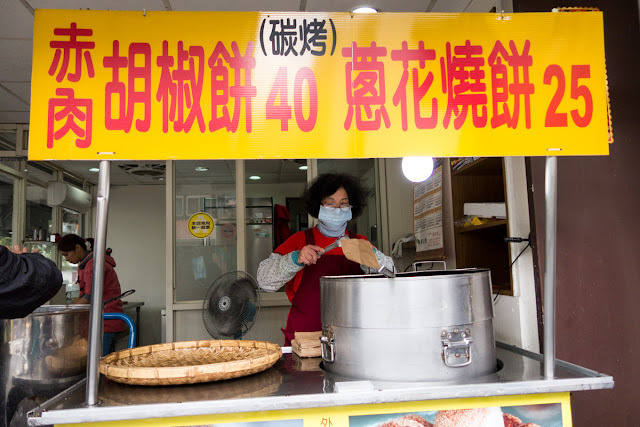 Lao Cai's Shuijianbao (老蔡水煎包) shop, great for takeaway buns. Old Cai's pan-fried steamed buns come in the flavours of cabbage (高麗菜), garlic chive (韭菜), or pork (鮮肉). 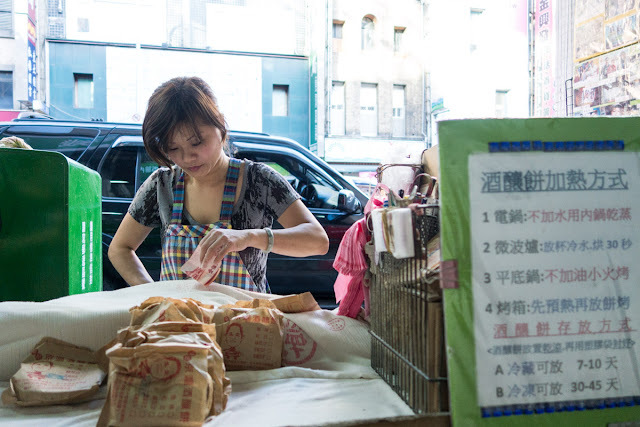 You can also get beverages such as black tea (紅茶), soy milk (豆漿), or peanut rice milk (米漿) to accompany your buns. 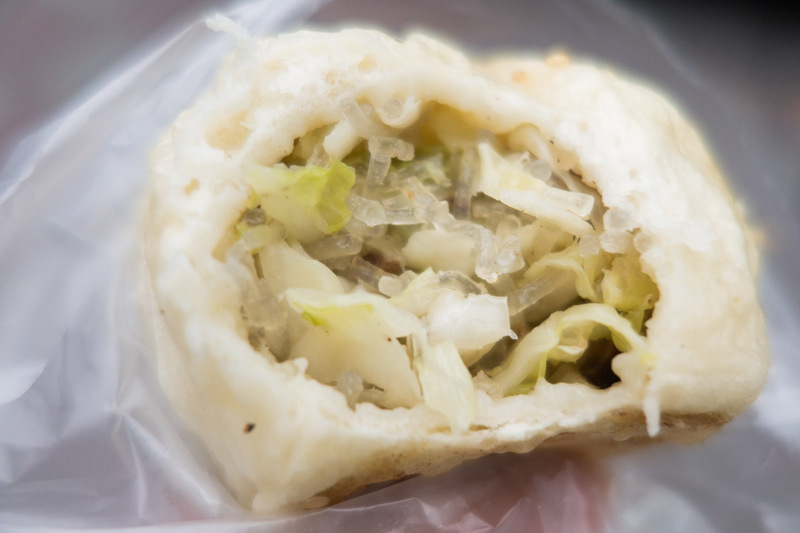 Cabbage bun (高麗菜包), 13 NTD. 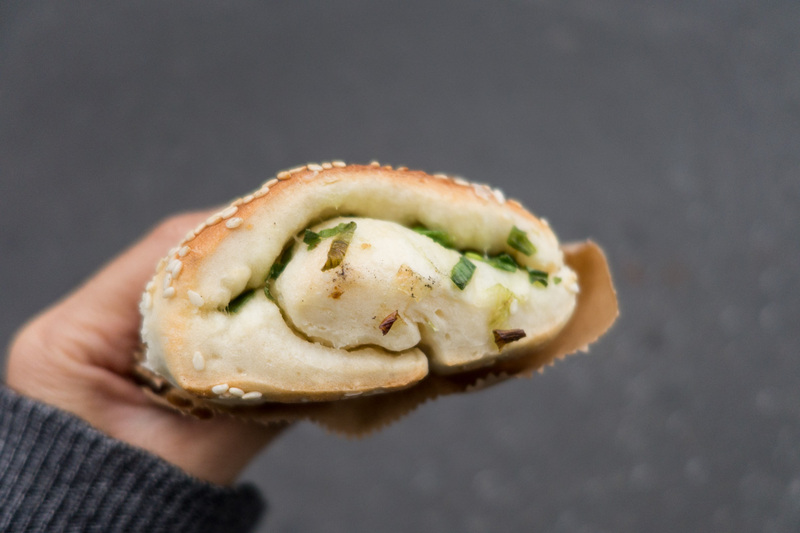 Garlic chive / Chinese chive / Chinese leek bun (韭菜包), 13 NTD. 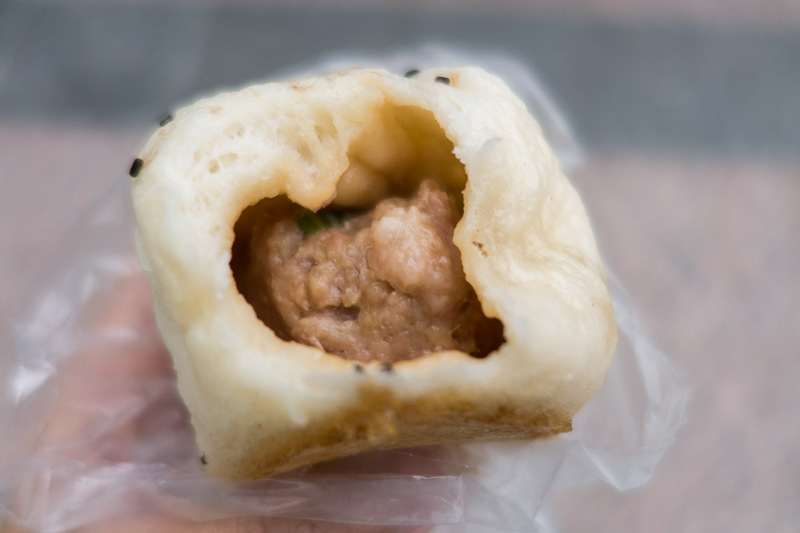 Pork bun (鮮肉包), 13 NTD. 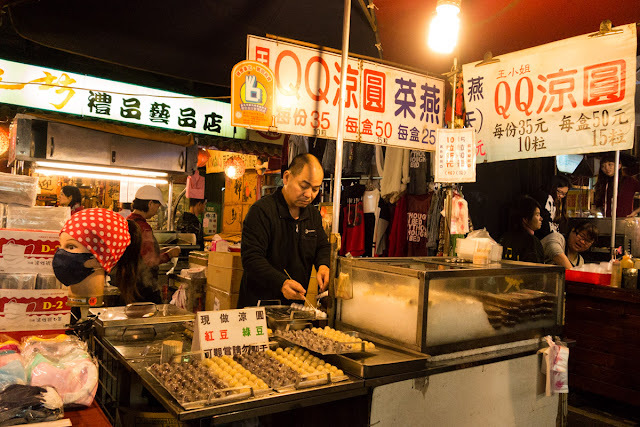 Occasionally we do brave the crowds at the night markets in Taipei. We were thankful that we didn't have to wait very long to get our teppanyaki chicken at this stall in Raohe night market (饒河夜市). 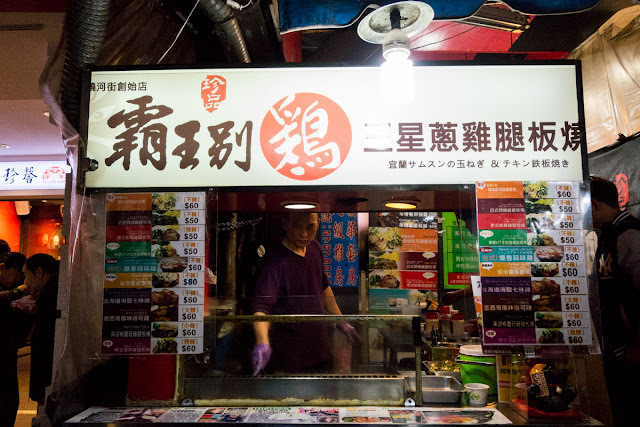 If you understand Chinese characters, you'll be amused by the name of the stall - it's a puntastic twist on the movie title Farewell My Concubine, with the word "chicken" replacing the word "concubine", a perfect fit as the two words sound exactly alike. Bawangbieji teppanyaki chicken stall (霸王別雞三星蔥雞腿板燒) at Raohe night market (饒河夜市). Anyway, we enjoyed this! 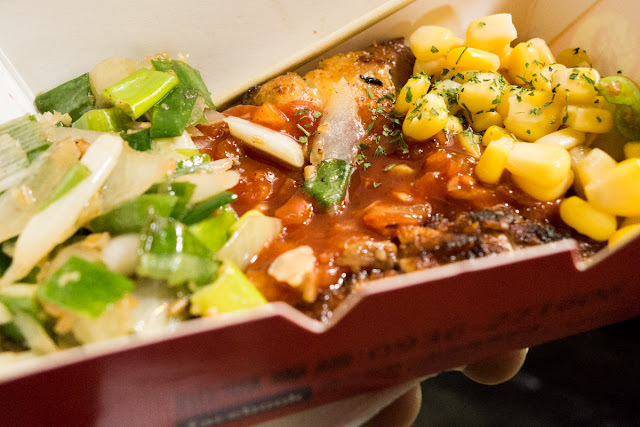 The chicken was succulent, and the accompaniment of sauce, spring onions and sweet corn intensified the juiciness of this dish. It's great value for money too, so the vendor should be saying farewell to many of his chickens at this rate! Spring onion teppanyaki chicken leg, 60 NTD. Speaking of night markets, you may spot these intriguing little bouncy cool jellies that they keep chilled on ice (QQ涼圓) making an appearance from time to time. Miss Wang's QQ jellies (王小姐QQ涼圓菜燕). Typical fillings are red bean or green bean paste. They make a simple, light and refreshing dessert. 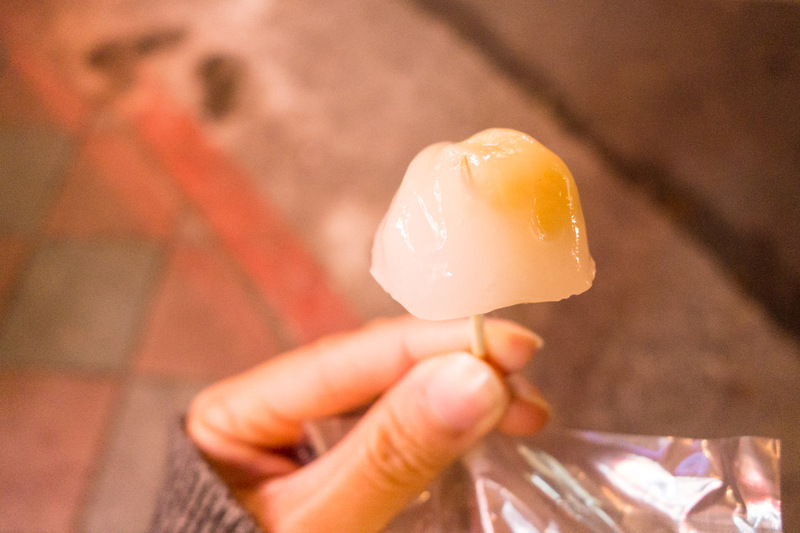 Ice jellies (QQ涼圓), 10 pieces for 35 NTD. Very importantly, towards the end of our stay in Taipei, we stumbled upon pepper buns (hujiaobing 胡椒餅), and wow, are they scrumptious. 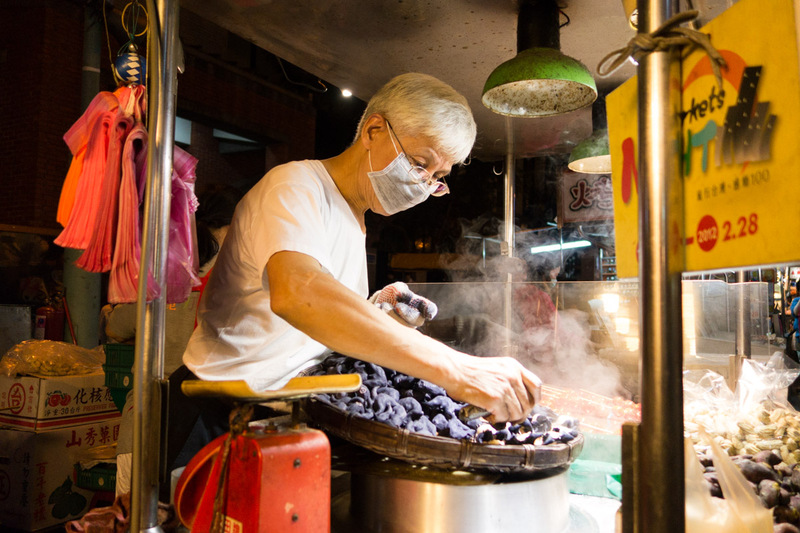 Charcoal baked pepper bun stall. Behold this gloriously seasoned meaty filling encased within a crispy golden brown pastry. It was quite the revelation. 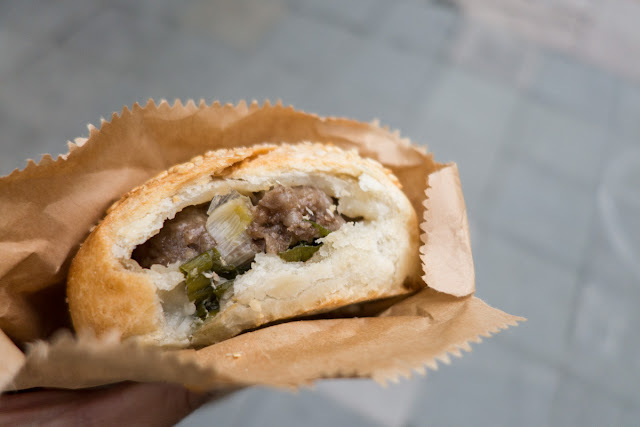 Charcoal-baked pork and pepper bun (碳烤赤), 40 NTD. The spring onion buns from this stall (whose name I do not know) were actually not half bad either, even though the pepper buns are hard to beat. Charcoal-baked spring onion roll (碳烤蔥花燒餅), 25 NTD. So that's it for the food stuff! 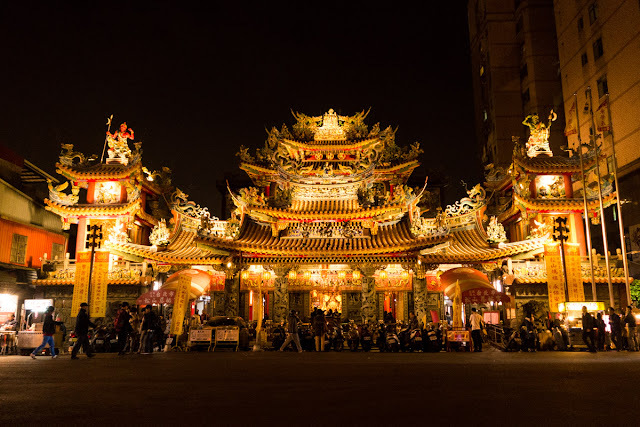 I'll share a few other things while I'm here, to give you some idea of other aspects of Taipei. Starting off with a dog pic, just because. 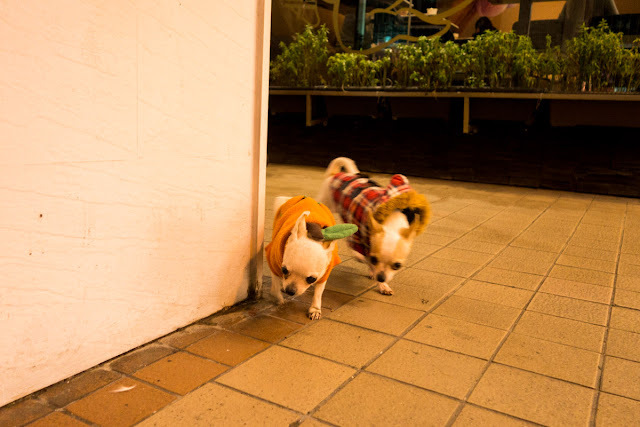 These little dogs look like Sherlock and Watson to me! 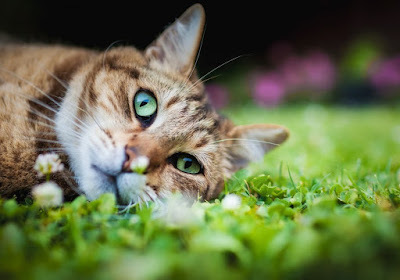 Too adorable!! 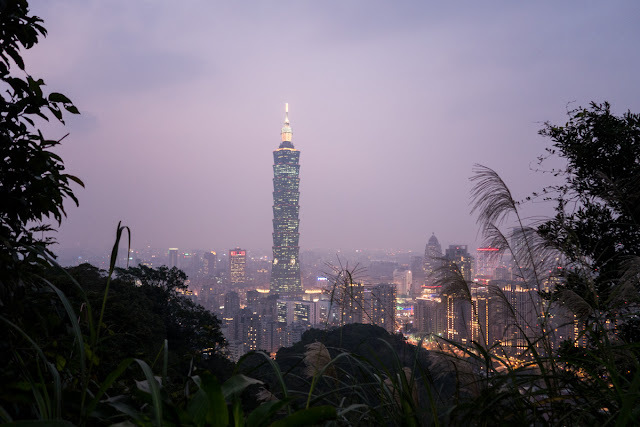 Taipei 101 (台北101) view from Elephant Mountain (象山) hiking trail. Ciyou temple (慈祐宮), dedicated to the sea goddess Mazu. The Moon Bus, an art installation of some sort. We just happened upon this without knowing such a thing existed, and the unplanned, unexpected discovery made it all the more delightful. 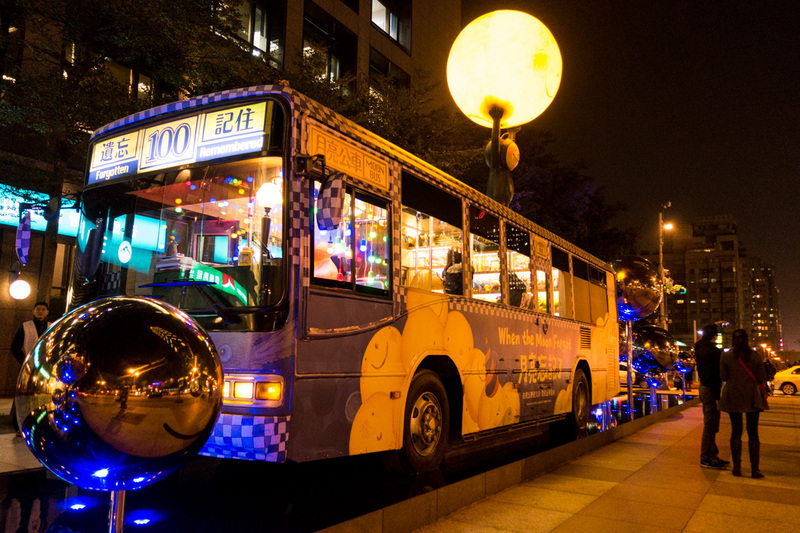 The Moon Bus in Taipei (月亮公車). And... it's a wrap! While I haven't been blogging very frequently or consistently this year, I do hope you have enjoyed the posts that I did manage to put up, even if some of them are, um... extraordinarily delayed. And I will definitely try to continue to keep at this. Having said that, I can't promise when my next post will be, but I'd like to say January. So in the meantime, happy holidays, stay safe, and I'll see you around next year! 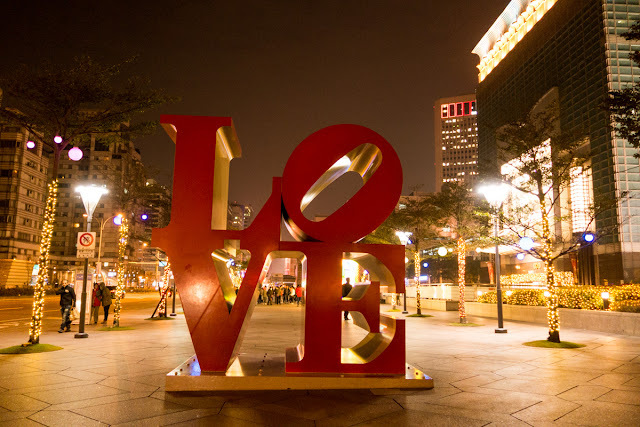 I always love your travel posts! How wonderful is Taipei? Around every corner something wonderful to eat and see.